Artistamps, as the name suggests, are produced by Artists/Mail Artists who depict their art on stamps that they have designed and produced. Passing this art through the mail, usually, but not always, accompanying genuine postage stamps, adds authenticity to their art. 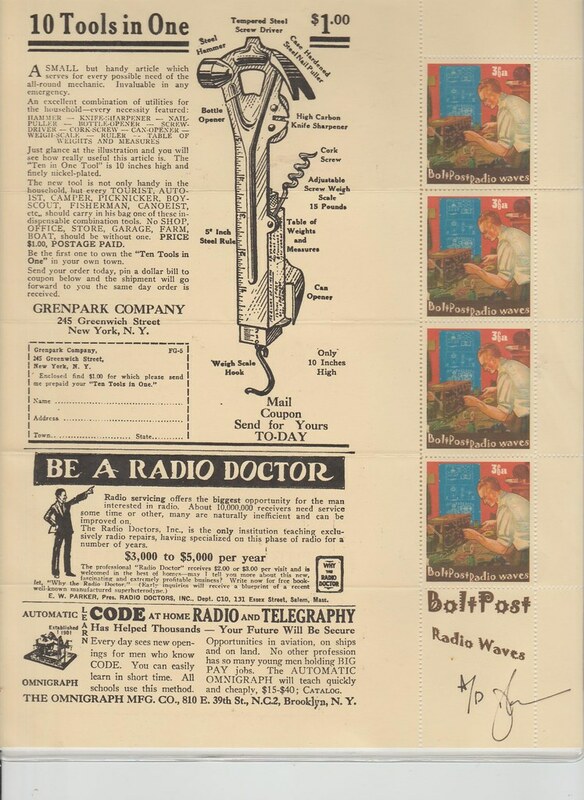 This example is from Bolt Post, Dennis P Jordan, and is a sheet of 4 stamps entitled Radio Waves accompanying 3 advertisements for a multi-tool, radio repair and learning radio and telegraphy (morse) code. It is signed as an Artist's Proof (A/P) but is not numbered.